Brewster bought a ticket with the numbers 4, 6, 12, 21, 24, and on Friday, January 27, they were announced in the National Lottery draw. The winning ticket was bought at Thomas mini-mart at Calder, and according to Brewster, she has been playing the numbers along with two other sets for the past six months. âShe was born December 24, and the 12 is for December. She died on the 21 of the 4th month and was buried on the 6th. âShe was a dear friend to my heartâ¦â Brewster added. A joyful Brewster claimed that when the lottery numbers were drawn on Friday night, she didnât have enough time to record the information, but on Saturday morning she confirmed she was the jackpot winner. âMy first order of the day is to give God thanks and praises for it. Iâm going to spend it wiselyâ¦ Iâm a Spiritual Baptist, and I usually have a âThanksgivingâ praise every year and by the grace of God. Itâs going to be bigger this year with the help of this money,â she said. Winning the lottery is a blessing to her, she said, as she is now able to assist her sister who resides in the United States and was recently diagnosed with Breast Cancer. âShe has a lot of bills to pay, so Iâm going to do what I have to for my brothers and sisters and nieces and nephews. But Godâs order is first and everything else after. âI was in America for the past sixteen years and I was the bread basket for the family, and I came home because of my mom who passed away, and I was at a point where I was scraping the bottom of the barrel,â she said. âThis is my breakthrough, so I thank God for that,â Brewster commented. Meanwhile, General Manager of the NLA, McGregor Sealey, during his congratulatory message to Brewster, advised her to spend her winnings âwiselyâ. 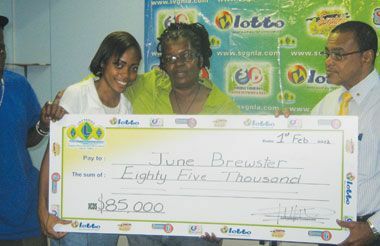 âHer winnings are just $85,000, but it just goes to show that the jackpot can be won at any time. I just want to encourage all of our players to continue playing the National Lottery island numbers game, because one ever knows when luck is going to strike.